Hi Friends! I first want to thank all of you for your kind words on my Family Room Reveal Post! You all are way too kind and know how to put a smile on a girl’s face. Thank you for all of your encouragement, I really appreciate it. 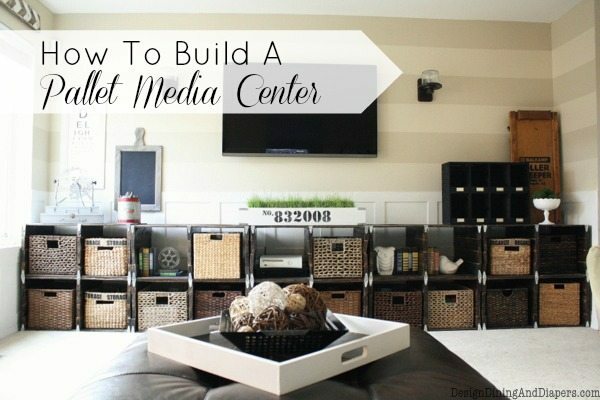 As promised, here is my tutorial on How to Build A Media Center out of Pallets, so here we go! It is actually a fairly easy project, as long as you are comfortable using a circular skill saw. While it may be pretty straight forward, it does take some time because of all the different steps involved and waiting time. There are probably several different ways to do this, but I’m showing you exactly how I made mine. These are the pallets that I started with. I chose this style because the boards were evenly placed across the pallet and they were all in tact. 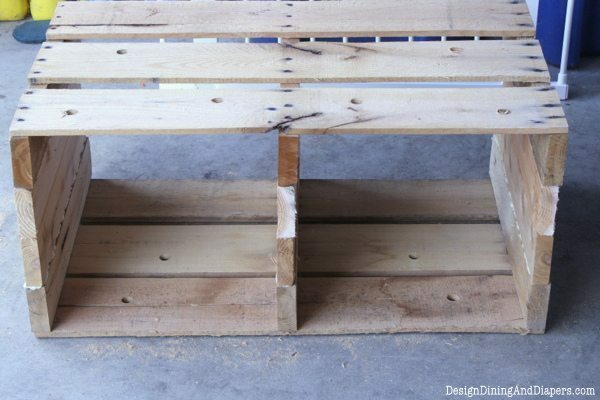 For this project, it is extremely helpful to use pallets that are exactly the same size, this way they will fit together senselessly and the end result will look more polished. 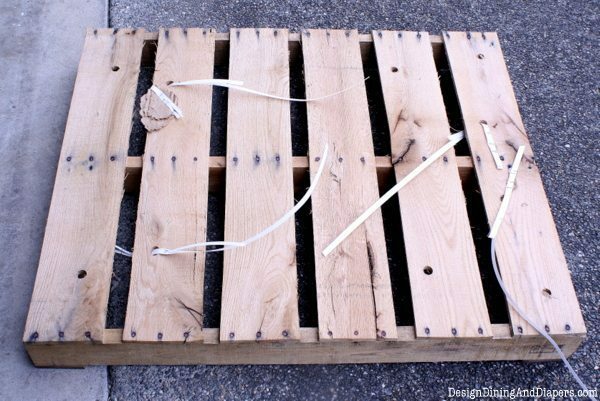 Start by removing all of the staples and debris attached to the pallets. Then cut the pallet in half, horizontally. My pallets had exactly 6 boards across, so I cut straight down the middle so there were three boards on each side. Flip the pallets over and remove the two boards attached to the underside. Now you should have two pieces exactly alike. 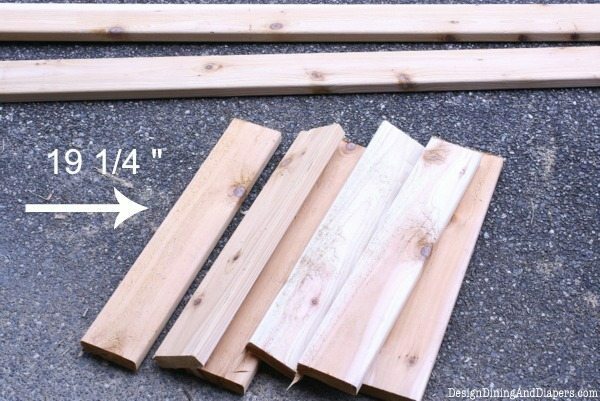 Take your 5/4 X 10 X 4 boards and cut them to fit the length of your pallet. These boards will be used to make the pallet taller. Mine measured 19 1/4″ long. Place a thin line of glue on top of the boards that are already sticking up from the pallets, and then place one 5/4″ X 4 X 19 1/4 ” boards on top of each board. Press gently to secure them. Note: Use the foaming Gorilla Glue like pictured above. A little bit of this glue goes a long way. It will expand when it dries and it is extremely strong. The Gorilla Glue that is more of a cream color is not as strong and might not old this project together. 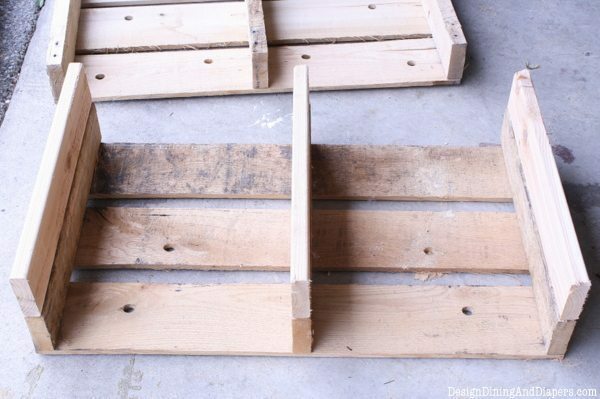 When placing the boards on top, make sure to align them with the ‘good’ side of the pallet. Meaning, the side that was not cut with the saw. This will be the ‘front facing’ part of the cube system and they will be nice and even. We’ll trim the back in a few steps. Wait about an hour for the first layer to dry. Place another layer of glue onto the boards, then add another set of 5/4″ X 4 ” 19 1/4″ boards. Apply another layer of glue, then place the second pallet section on top, creating your cube system. I placed two layers of boards in between the pallets in order to fit the square baskets I was using. But if you wanted to use smaller baskets you could remove a layer of boards. One unit measures 19 1/4″ deep, 32″ across and 14 1/2 ” high. You may notice in the picture the foaming gorilla glue seeping out between the boards. I used an X-Acto Knife to trim away the glue when this happened. Just wait for it to dry first. This is what the ‘back’ or ‘rear-facing’ side of the pallet will look like. We all know pallets are rustic and not perfect, and I’m sure my cuts aren’t perfect either. So, I used the Skill Saw to trim this section the best I could. 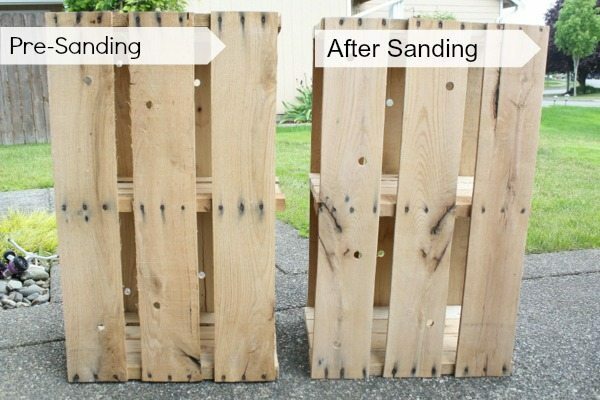 Next, using an electric sander, sand down every crevice of your pallets. The more you sand the better the stain will take to the wood. I sanded the top, bottom, inside each cubby, etc. I didn’t over do it, but definitely spent some time smoothing out the wood and removing any splinters or bad spots. Now we are getting to the fun part, choosing your stain. I knew I wanted mine a dark stain so I chose a few samples and tested them out on the wood. 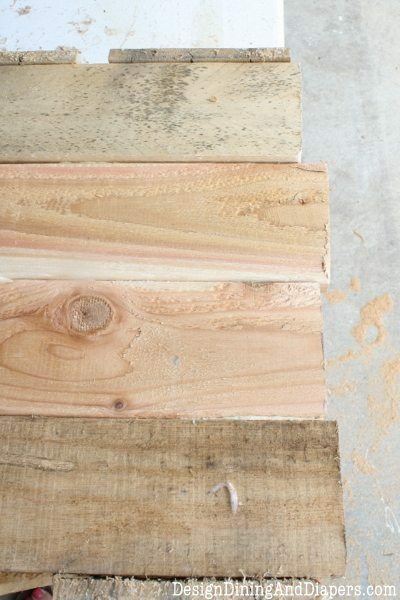 Always remember to test out the stain first because each stain will take differently to different types of wood. Even the same color in a different brand will look different. I went with Minwax Dark Walnut (far left) for this project (And most of the projects in my home. It’s my ‘go-to’ stain). You can apply the stain using either a brush or a soft rag (like from an old t-shirt). I prefer to use a rag, I think it applies a little more evenly. Now, for this project I only used one coat of stain and didn’t worry about making it perfect. I wanted these to have more of a rustic look so I wasn’t worried if there were spots that were uneven or not completely covered. 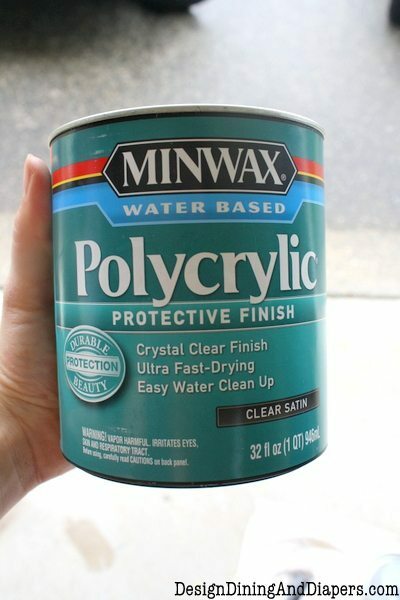 Allow the stain to dry overnight and then apply a few layers of Polycrylic sealer. I used a clear satin sheen to help keep its rustic look. Note: Because of how large my ‘media center’ turned out, I ended up purchasing about five 32 oz cans of both stain and sealer. That’s where all of my money went to for this project. Unfortunately, it adds up. 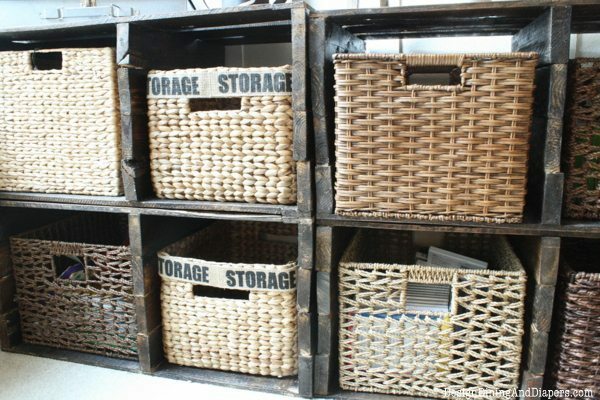 After the pallets were dry, I stacked two on top of each other across the entire wall and filled them with square wicker baskets. My pallet units fit almost perfectly across the room. However, I was 1″ too long on one side so I had a ‘make it work’ moment and had to take 1″ out of the middle of one of the units. Lastly, once the pallets were in place I added the hardware for both a decorative and functional purpose. To view the rest of the family room click here. This is Awesome Taryn! WOW — out of pallets! Amazing work girl! This is awesome. You are so creative! I love pallet wood projects, and this is one of the coolest I’ve seen in a while. Great job! Looks great! That is an awesome project :) Love the stain color too. So pretty. 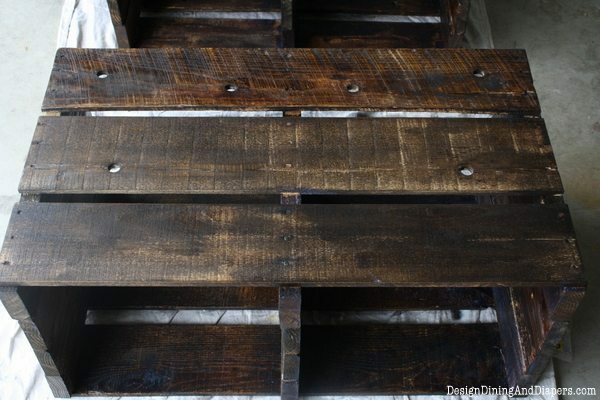 I love how pallets look when you sand and stain like you did. 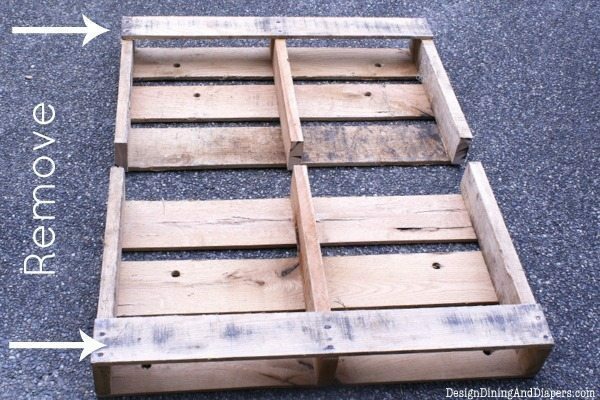 I am still trying to figure out how to incorporate some pallets into my home! LOVE IT!!!! Can I ask where you got your hardware and the baskets? Love how the baskets are different! We are building some cubbies in our laundry room and I need about 12 baskets and would love to mix them up like yours! I love the way this turned out!!! Taryn, these are gorgeous and you are amazing! I hope a) I get a saw for Christmas and b) I find a place in my home to do this! Thanks so much for the tutorial! I really love your idea! I may use this to build up a ‘library’ type wall in my living room!! These are fabulous. I would love to try this. It makes for great storage. Nice idea, very well done!! So fabulous! 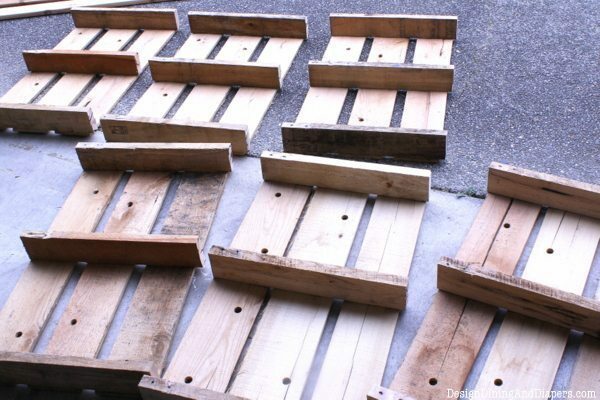 I still cannot resist a good pallet project. This is a great one! Thanks for the easy instructions too! Whoa. So cool! And so lucky to have a family source for pallets. I never can figure out where to get these without being arrested for stealing….. They look great and so do you in your safety goggles! You go girl! taryn, love this project! You always amaze me with what you do! Gr8! 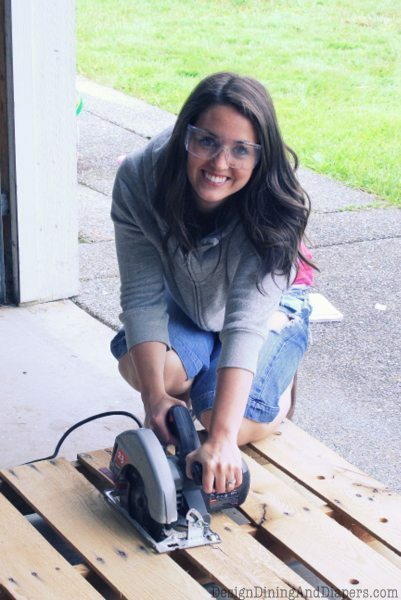 Do you ask for power tools for gifts too? Taryn, amazing! 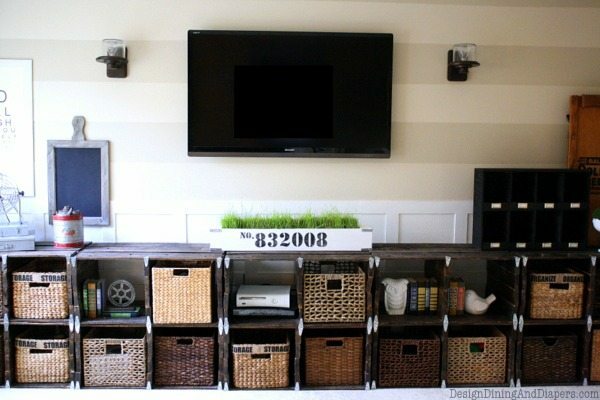 I love how you reused pallets and I really like the stain and the rustic color it gave your media center. Nice job girl, and a virtual high five!!! You did an amazing job. I love this idea and the rustic look of the unit. Just beautiful! I’m IN LOVE! My question is: How many freakin’ pallets did you have to use? 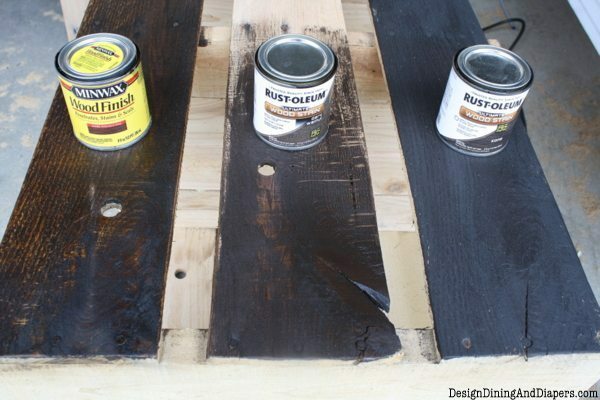 I love this but I doubt I’ll be able to find that many matching pallets. 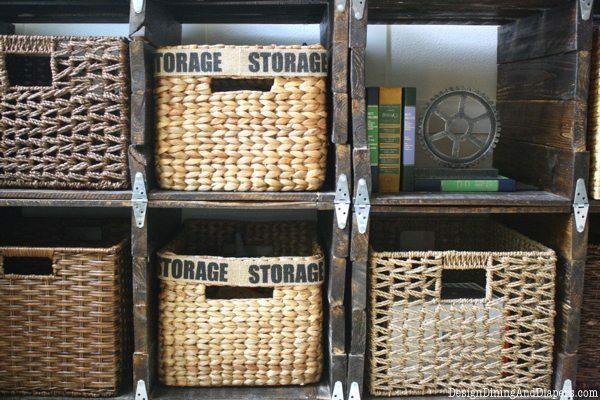 I planned to do something similar with the “apple crates” that they sell raw at Michaels or JoAnns but I think the pallets would be MUCH stronger and hold up for a lot longer. Thanks so much for your tutorial and your bookshelf turned out great! This is a great idea- the only thing is that it looks like you could have benefited from clamping the sides your glued together so they were straighter. It would be helpful to reinforce the sides with something other then glue as well in case you want to place things on top. 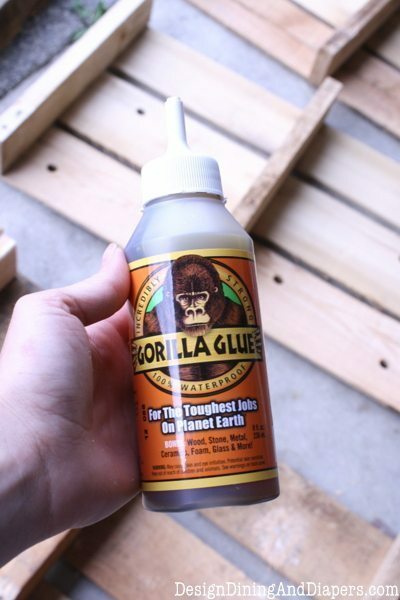 Gorilla glue is great but it is still just glue and with wood expanding and shrinking due to humidity and heat, I would not use solely glue. I agree Kim. I wonder if there is anything in the baskets. I would be scared to stack them. They look amazing, but I would have added a small vertical piece of wood, on the inside sides. I would have used short nails (maybe roofing) to secure it to the pallets and the glued boards. I am seriously thinking about this project for my living room. Has anyone else made this project using only glue? Were you able to store REAL stuff in the baskets? I can’t help it. The glue thing kind of reminds me of Zoolander 2. Hi Grace! The Gorilla Glue I used is really strong, and I did store heavier things in the baskets like books and toys, etc. I didn’t have any problems. I also added the brackets to the front that were decorative but also help secure the top an bottom together. But it doesn’t hurt to add even more strength to the piece! How do you detach the board from the underside of the pallet?